While thousands of Sikhs were emigrating to the West from Punjab in the 1960’s seeking better prospects, one of them went over to spread the universal message of Sikhism. Harbhajan Singh, popular as Yogi Bhajan, passed away at his Espanola, New Mexico, home Thursday, October 7. He was 75. Indo-Asian News Service — From the simple environs of Espanola in New Mexico – complete with a Golden Temple – Harbhajan Singh or Yogi Bhajan to his followers spread the Sikh faith in the West. The founder of the “3HO” or Healthy, Happy, Holy Organisation died of heart failure surrounded by family, friends and followers Wednesday. He was 75. The cremation will take place in Santa Fe in New Mexico and memorial services will be held worldwide. The Miri Piri Academy here – set up by Yogi Bhajan — to train Westerners and Sikhs settled abroad on the values of Sikhism was under a wave of shock and disbelief on hearing about his death. The supreme Sikh religious body – Shiromani Gurudwara Prabandhak Committee (SGPC) — closed its offices Thursday after news of Yogi Bhajan’s death came. SGPC president Bibi Jagir Kaur paid tributes to the yeoman service that Yogi Bhajan had done in spreading the message of Sikhism in western countries. Yogi Bhajan was born Harbhajan Singh Puri on August 29, 1929, in Lahore (now in Pakistan) and went to school in Dalhousie, Uttaranchal. Son of a doctor who had migrated from Pakistan after the Partition in 1947, he had only the clothes that he was wearing when he first reached the Indian side of the border. A large part of his life was spent in India where he worked as a civil servant. A friend of some of the most influential figures in the world, Yogi Bhajan lived in an ashram-like environment in Espanola, complete with a Golden Temple recognised by the Akal Takht, the highest temporal body of Sikhism. He was well versed in many fields with a deep grasp of worldly matters and a compassionate insight into the human condition. He is arguably the pioneer of spreading Kundalini Yoga in the West and inspiring thousands of people in the US to embrace Sikhism. A recent article in The New York Times read: “In the New Age culture here, the Sikh Dharma community, founded in the early 1970s, provides a place where admirers of Yogi Bhajan, a Sikh spiritual leader and yoga master, can live in harmony and follow their beliefs in vegetarianism, meditation and community service. In 1968, on retiring as chief of customs at what is now the Indira Gandhi International Airport in Delhi, Yogi Bhajan first moved to Canada with a letter of recommendation from Canadian High Commissioner in New Delhi James George, who was his yoga student. Sikh Dharma is a religious community that also runs a number of affiliates such as Akal Security, one of the nation’s fastest growing security companies. Yogi Bhajan used funds from his successful commercial interests in the US to propagate Sikhism and its ideals. He was a self-transformed vegetarian and had been able to impress upon scores of people towards vegetarianism. 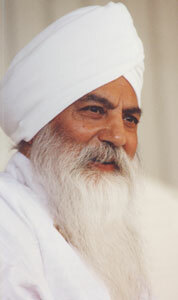 Yogi Bhajan was a master of the ancient science of Kundalini Yoga, which he began teaching publicly. He offered a cure for addiction that was a mix of yoga, meditation, yogic philosophy and loving acceptance. He called it the “3HO” (healthy, happy, holy) way of life. A friend of senators and governors in the United States, Yogi Bhajan has also met with the Pope, the Dalai Lama and other spiritual figures. Moving with the times, Yogi Bhajan – who acquired US citizenship in 1976 – was even referred as the Pope of new age Sikhism. “He was a tech-savvy new age guru who made full use of technology to propagate the message of Sikhism,” an SGPC executive committee member said.